Just like conventional covered car parks, Solar Car Parks can provide your customer’s and/or staff member’s cars with additional shelter and protection from the elements. 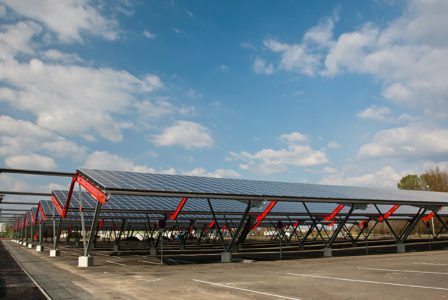 Unlike normal car parks, however, Solar Car Parks generate power, and provide your business with a sure-fire way to save on electricity bills. Infinite Energy can custom design and engineer a Solar Car Park for your business, providing your organisation with full financial analysis, including pay-back periods and expected annual savings. We’re able to help build your Solar Car Park from scratch, or install solar panels on existing structures. Solar energy is officially the most affordable and cleanest form of all renewable energy available in Australia. 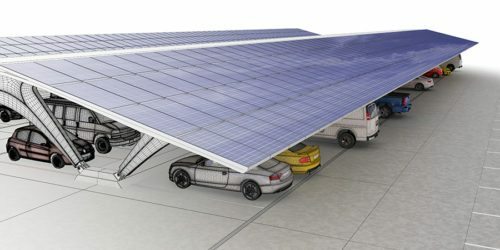 By investing in a Solar Car Park, your new structure will generate free, clean electricity, which will be discreetly cabled into your building. The average solar panel measures around 1.6m x 1m, while the average car space measures around 2.7 x 5m, each car spot can potentially have around 3kW worth of solar panels. This equates to 4.8MWh worth of electricity per year, generating anywhere from $720 to over $1,000 in savings, per car bay. As the number of car bays go up, so quickly do your savings. This is why Solar Car Parks can pay for themselves in just two to three years. After your Solar Car Park has paid for itself, it can help completely offset your business’s daytime electricity bill. Providing undercover car parking attracts and retains customers, offering both greater security and comfort for their shopping experience. The installation of solar panels will visually symbolise your organisation’s commitment to sustainable practices, increasing your appeal over competing businesses. Not only do Solar Car Parks deliver a return on an investment that has been traditionally been a non-profit capital expense, they also help the environment. By offsetting the power you would normally purchase from the grid, your Solar Car Park will drastically minimise your organisation’s CO2 emissions. Infinite Energy can install Electric Vehicle Chargers at your chosen car bays, allowing customers and/or employees to charge their vehicles with solar energy. Infinite Energy will analyse your business’s electricity needs and recommend the perfect system size for your consumption profile. Infinite Energy will design your Solar Car Park, taking into account shading requirements, how it fits in with your existing structures, and of course, aesthetic appearance. Construction will begin on your Solar Car Park, with our CEC approved electricians installing your solar PV system. Infinite Energy will set up online monitoring, enabling you to check your system is performing as expected. If you’re the building’s landlord/strata owner, you can install a Solar Car Park and sell the solar electricity your system generates to your tenants at the gazetted rate. A revenue stream becomes available to the landlord/strata owner, as you’re receiving payment for electricity that was essentially free to generate. This revenue can be used to pay off your Solar Car Park, offset levies, further contribute to a sinking fund, or pay for upgrades to increase the attractiveness of your site. If you’re interested in learning more about what investing in a Solar Car Park could do for your business, click here to request a no obligation callback, or give us a call on 1300 074 669.